Worcester, Mass. - Playing a "home" game away from home is a familiar concept to Shrewsbury, which played the Sharon Eagles at Assumption College on Tuesday morning. The Colonials' balanced offense and strong defense helped them come away with a 6-2 victory. To start, the Colonials and Eagles were in quite the goalie battle. Both Jonathan Greenberg for Sharon and Mike Fornal for Shrewsbury stood on their heads and made this a 0-0 game through most of the first quarter. That was until Shrewsbury attackman Alec Buduo found the back of the net with a minute remaining to put the Colonials up 1-0. Once again, Greenberg and Fornal both played tremendous in the second quarter, where no goals were scored and some great back and forth lacrosse was played. In the third, Kyle Spagnuolo of Shrewsbury found the back of the cage to bring to score to 2-0. Chris Campbell followed with another goal to make it 3-0, before Spagnuolo scored his second to make it 4-0 Shrewsbury. “My first one, I came down the left side, had a nice dodge, and then I rolled back and knew I had the shot so I took it and it went it” Spagnuolo said of his first goal. “The second one we were on the man-down, and I was running in with a double team and I just came around the net and felt confident enough to put it in and I did” he said of his second goal, which gave Shrewsbury a comfortable four-goal lead. Mason Kohn scored for Shrewsbury to make it 5-0, but then Kadin Nestler put Sharon on the board with 9:27 remaining in the fourth. 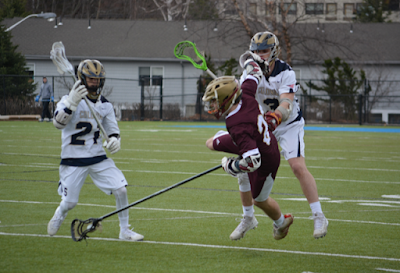 Shrewsbury attackman Ryan Haley dodged from X, drawing the defender of his linemate Cole Russo, who he fed and then Russo finished, making the score 6-1 Shrewsbury. Spencer Hall scored for Sharon with a under a minute remaining, making it 6-2 Shrewsbury, but Shrewsbury then ran out the clock and won by a score of 6-2. A win today was huge for the Colonials, who were coming off of a close 4-3 loss to Minnechaug on Saturday, a game that could have gone either way. “It was a loss, but it’s not what you’d consider a ‘bad’ loss,” said Shrewsbury head coach Nate Skermont. “We tried to build off of that, but I thought we came out flat today. We kind of fixed that a little bit at halftime, and you saw a little bit more in the second half, but we’ve got two tough ones coming up against Westfield and Saint John’s, so we knew we needed to come out here and get the first one of the week to get us rolling and then go from there. Anytime you win, that’s what you came here to do, so it was good to get that win today” he added. Historically, Shrewsbury has been known to have a solid defense and one or two stud goal-scorers on offense, but this year the offense seems to be extremely well balanced. All three attackman can put the ball in the net, as well as the midfielders, not to mention LSM Chris Campbell, who has four goals and two assists on the year, adding his fourth goal today. “I think if you have an offense where everyone is a threat, it keeps the defense honest” Skermont said. “It’s big, especially when you come out and aren’t crisp. You don’t have to rely on only one guy to get you going. You also then make their on ball defense critical because if you force a slide to happen the open man is a legitimate threat” he then added. Things get no easier for Shrewsbury this week, as the Colonials host Western Mass power Westfield on Thursday, then welcome Central Mass powerhouse/cross-town rival St. John’s (Shrewsbury) on Saturday.